The heel is the prominence at the posterior end o the fit. 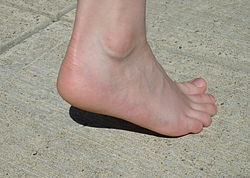 It is based on the projection o ane bane, the calcaneus or heel bane, ahint the airteeculation o the banes o the lawer leg. This page wis last eeditit on 29 Apryle 2017, at 05:10.